When it comes to brewing wild/sour/funky beer, it turns out there aren’t many resources out there. Unlike homebrewing in general, where you’ll find more “how to brew” books than you could possibly know what to do this, the relatively esoteric niche of brewing both traditional Belgian sours and their newly Americanized brethren are sadly represented both in print and online. Online, you’ll find some great blogs like The Mad Fermentationist, Bear Flavored Ales, and brewing sub-forums like Homebrew Talk’s Lambic & Wild Brewing section. 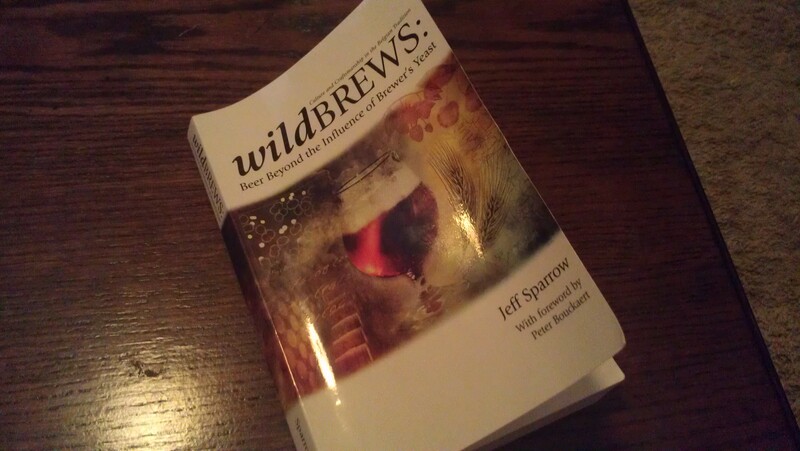 When it comes to print, though, Jeff Sparrow’s Wild Brews is pretty much the only game in town. This might seem odd considering the glut of general homebrew books out there, but in many ways it makes sense. Brewing sour beers is a very, very small niche when you consider how small of a niche hobby homebrewing itself is to begin with. Also, this book has largely been canonical in the world of sour/wild beer brewing. Finally, it’s just not a part of brewing that is particularly well-understood. The use of Brettanomyces and souring bacteria, in my opinion and experience, is much more of an art than a science. You may be able to brew a house IPA over and over and over that you’ve been able to nail down, but on a homebrew level it’s going to be very difficult to brew the same lambic twice. There are just too many vaguely understood moving parts. Wild Brew is less than 300 pages, but those 200-some odd pages are densely packed with a ton of information. I was concerned that it would be overly “science-y”, but my fears were unjustified. Even at its most scientifically in-depth sections, the average brewer should have no problem comprehending most of it. The book starts with an overview and history of the classic Belgian sour styles (Lambics, Flanders reds, Flanders browns/Oud bruins), then proceeds to a whirlwind tour of the breweries in Belgium which brew and sell sours. Many of them you’ve probably heard of (Cantillon, Drie Fonteinen, Rodenbach), but there were a handful that were new to me. There is an illustration section which shows photos of many of these breweries. It then proceeds on to the science of how sour beers end up like they do, describing the yeast/bacteria involved, the life cycle of fermentation, and the effects of different fermentation vessels that pro brewers use. It then wraps up by explaining how you can make this magic at home and provides a number of recipes that you can use to brew these classic styles. Verdict? Wild Brews really is canonical for a reason. The information contained in it is damn near exhaustive when it comes to brewing classic Belgian sours. It’s an invaluable asset to any homebrewers who want to start down the path of brewing sours or even for the sour beer lover who wants a better understanding of how the beer he or she is drinking was made. The only qualm I have with the book is that I wish that Mr. Sparrow would issue an updated version of the book. I realize it focuses primarily on the classic Belgian styles of sour beers, but a lot has changed (in particular, in the United States) since 2005 when it comes to craft beer and the rise of sour/wild beers. New strains of Brettanomyces and Brett/bacteria blends have been released by White Labs and Wyeast since then, as well. Overall, though, that’s just me nit-picking and it shouldn’t deter anyone from purchasing this book. Available for less than $15, this is easily the most enlightening homebrew-related book I’ve read since I opened John Palmer’s How to Brew and started down this fun path. Excellent write-up. You’ve convinced me to seek this one out! Previous Previous post: Who Dey think gonna raise more money?